Don’t let the swim portion of a triathlon slow you down. Now there’s a way to efficiently and effectively train for your swim. New to triathlon or still ramping up to an IRONMAN? No worries! 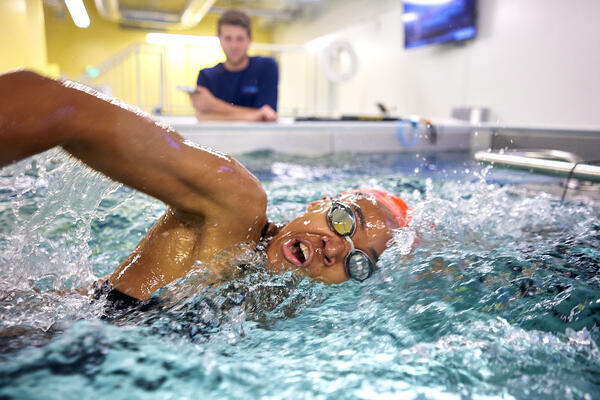 Everyone benefits from SwimLabs’ one-of-a-kind stroke analysis, which uses our 360° video system, in-pool mirrors and analytic software so you can receive thorough and immediate feedback on your freestyle. All athletes have access to our extensive library of videos, so you can see your stroke next to world-class pool and open water swimmers. After your lesson, you’ll receive your video and notes from your instructor, along with drills you can use while training for your next event. At SwimLabs, we offer private and semi-private lessons for triathletes. Check with your local SwimLabs location for additional offerings such as open water swimming. Team nights provide each triathlete with 20 minutes of instruction and video analysis of their freestyle. SwimLabs instructors will be facilitating lessons but we value and encourage coaches input and active participation. At the end of their session, the triathlete will receive their video analysis via email. SwimLabs is also able to host triathlon club meetings, open water swimming/nutrition seminars, event packet-up, and more! Please contact you local SwimLabs to set up an event for your team. IRONMAN Certified Coaches – contact your local SwimLabs for partnership benefit information!